Sifu Jim Wilkinson was born in Stanley, Hong Kong 1963 and moved with his family to live in Australia in 1967. He began learning boxing from his father at the age of 8 and studied Karate for a number of years in his early twenties. Sifu Jim Wilkinson went with his wife and family in 2004 to continue his martial arts training in Hong Kong under the instruction of Master Chan Ko Wah who continues to be his Sifu today. During this time in Hong Kong Sifu Jim Wilkinson trained in the traditional ways of Hung Kuen Kung Fu for both forms and weapons. 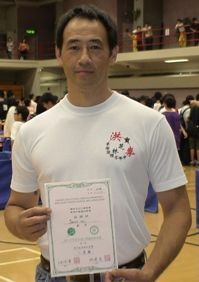 He has done a number of public Kung Fu Performances while in Hong Kong and also entered the Hong Kong Chinese Martial Arts Association, Martial Arts Competition (an International Level Competition) in 2006 and was awarded a First Place. Having returned to Australia he is Sifu of Australian Hung Kuen Kung Fu. His school is a member of the Australian Kung Fu and Wu Shu Federation ( the peak martial arts body in Queensland and also executive member of the Martial Arts Industry Association -Peak Industry Body for Martial Arts in Australia). “From the outset , even from the development of the name of our school ( the first word in the name is Australian ) through to the development of our logos ( the inclusion of the Southern Cross ) the aim of this school is to be a force for good in the lives of everyday aussies, young and older. We have been in operation now since August 2006 and my initial belief about our mission has proven to be correct, I have been able to share the journeys of my students and seen the transformation in their health , vitality and mental outlook as a result of Gung Fu . As I say to my students , it is both my obligation and privilege to be Sifu”.